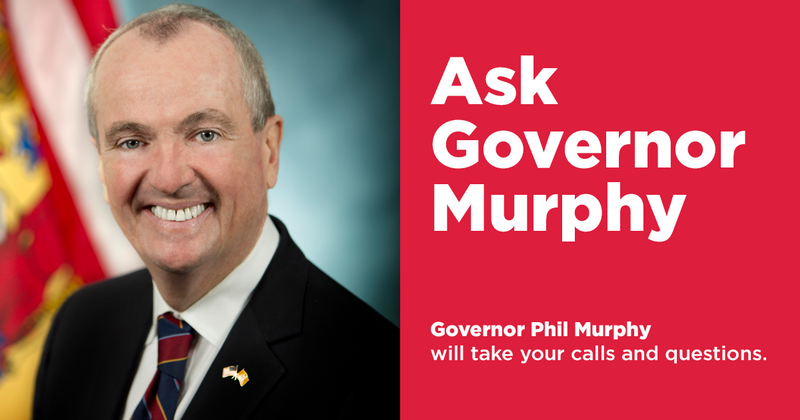 WBGO, in collaboration with WNYC and WHYY announces "Ask Governor Murphy," a live call-in broadcast with New Jersey Governor Phil Murphy. Do you have a question? Ask it here! Tune in at 7pm, March 13nd to WBGO, 88.3FM or find the broadcast right here at WBGO.org. Taxes, Transportation and Wrestlemania discussed on "Ask Governor Murphy"
New Jersey Govenor Phil Murphy and host Nancy Solomon took calls and social media questions on a number of topics during the most recent edition of Ask Governor Murphy, a WBGO News production in collaboration with WNYC and WHYY. Ask Governor Murphy airs monthly. Click above to hear the entire show. Legalization of Marijuana and School Funding Discussed on "Ask Governor Murphy"
The latest edition of Ask Governor Murphy focused on several issues, including the legalization of marijuana in New Jersey, why some school districts are seeing drastic cuts in funding through the proposed state budget and what is being done to improve NJ Transit. Ask Governor Murphy is a WBGO News production in collaboration with WNYC and WHYY. The show is hosted by Nancy Solomon. State snow storm response, Amazon, immigration policy are some of the topics addressed on this edition of Ask Governor Murphy. Nancy Solomon is the host of Ask Governor Murphy, a WBGO News production in collaboration with WNYC and WHYY. Newark, NJ – The next "Ask Governor Murphy” program, the statewide, live call-in show produced by public radio stations WBGO in Newark, WHYY in Philadelphia, and WNYC in New York, is scheduled to air on Monday, July 16 at 7:00 p.m. Additional shows in 2018 will air on Monday, September 17 at 8:00 p.m. and Monday, November 19 at 7:00 p.m. The show is hosted by the Peabody-Award winning journalist Nancy Solomon, New Jersey managing editor for WNYC, and is broadcast live from the WBGO studios in Newark. New Jersey Governor Phil Murphy says the state is preparing for what could be a major storm. Murphy says gusty winds could bring down power lines, and utility companies in the state have activated their mutual aid arrangements. The Governor says the state has enough personnel and equipment to clear snow from the roads. Governor Phil Murphy is breaking down the $242 million increase he's proposed in his budget plan for upgrading New Jersey Transit. New Jersey Transit executive director Kevin Corbett says the governor's proposal allocates $19 million to expand the workforce with 114 new employees. New Jersey Governor Phil Murphy says a planned research and innovation center in New Brunswick could be a place for high-growth startup companies to thrive and boost the state’s economy. New Brunswick Mayor Jim Cahill says a city-owned site in the downtown area is earmarked for the project.